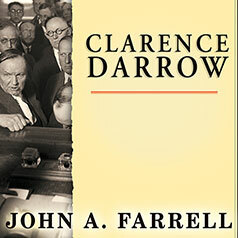 Drawing on untapped archives and full of fresh revelations, John A. Farrell's Clarence Darrow is the definitive biography of America's legendary defense attorney and progressive hero. Darrow left a promising career as a railroad lawyer during the tumultuous Gilded Age in order to champion poor workers, blacks, and social and political outcasts against big business, Jim Crow, and corrupt officials. He became famous defending union leader Eugene Debs in the land-mark Pullman Strike case and went from one headline case to the next—until he was nearly crushed by an indictment for bribing a jury. He redeemed himself in Dayton, Tennessee, defending schoolteacher John Scopes in the "Monkey Trial," cementing his place in history. Now, John A. Farrell draws on previously unpublished correspondence and memoirs to offer a candid account of Darrow's divorce, affairs, and disastrous finances; new details of his feud with his law partner, the famous poet Edgar Lee Masters; a shocking disclosure about one of his most controversial cases; and explosive revelations of shady tactics he used in his own trial for bribery. Clarence Darrow is a sweeping, surprising portrait of a leg-endary legal mind.